Ross Watson is an acclaimed game designer and role-playing game author from Austin, Texas. Watson, who has published more than 50 books, is also known as the lead designer behind the Warhammer 40,000 role-playing game books. 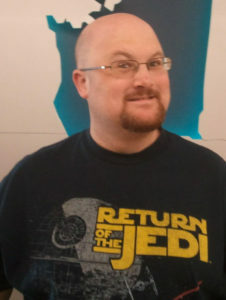 Besides his literary works, Watson has participated in designing video games such as Darksiders II, Warhammer 40,000: Regicide, and Battlefleet Gothic: Armada. Watson has also contributed in the Dungeons & Dragons, Lord of the Rings and Star Wars role-playing universes, with his latest joint project being the Savage Worlds role-playing game books. In addition to being the managing director of Evil Beagle Games, Watson also hosts the Gamer’s Tavern podcast, a show about gaming and game design. Ross Watson is looking forward to Ropecon – are you? This year will be Watson’s first time as a Guest of Honor at Ropecon. He will be holding lectures about role-playing game design and how to create game worlds, as well as attending the Passion and the Industry panel on how to turn your role-playing hobby into a career. Watson will also be showcasing his newest role-playing game, Rifts for Savage Worlds, at Ropecon. This will be my first Ropecon! I am very much looking forward to meeting and speaking with other RPG enthusiasts of all kinds. I hope to make new friends and share in the amazing community of gamers at the convention. I’m excited about presenting some ideas and discussions about game design, writing, and worldbuilding. Please don’t hesitate to come say hello! says Watson when asked how he feels about the upcoming event. Ross Watson will be joining the Danish larp guru Claus Raasted as a Guest of Honor in this year’s Ropecon.